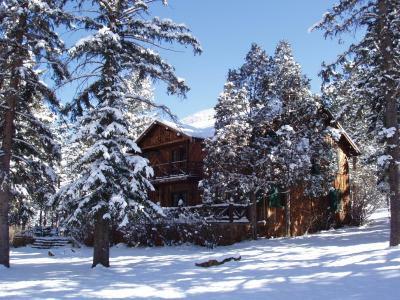 Lock in a great price for Rocky Mountain Lodge & Cabins – rated 8.8 by recent guests! Everything else was beautiful! Caretaker was very nice, great views, very clean everywhere else. Close enough to grocery or restaurants, plenty of things to do. Looking for something more than a traditional hotel try a cabin! Rocky Mountain gave me what I was hoping for...a clean quaint cabin just 5 miles from Manitou Springs Colorado. Looking forward to booking a honeymoon suite when completed in Feburary. The location was awful. It sits directly behind a very large older looking cabin that is really your only view! Breakfast by far was the best part of this place. Delicious 3 course breakfast, much much better than any restaurant I’ve been to. Debbie, the host, was so friendly. There was juice, coffee, and cookies available at all times, a great movie selection, hot tub, comfy bed, and beautiful house. Very pleasant hostess and the property is a beautiful mountain log house, easily accessible by car and close to many attractions. I'm torn between the amazing breakfast that Debbie exquisitely makes every morning and the hot tub in the snow. It was a wonderful retreat away from the city. The three course breakfast was amazing. The bedroom was comfortable with it's own theme. The owners were very helpful and nice. You could see the mountains whilst taking a shower. The first night we sat out in the garden for a while which was really nice. An excellent base for travelling to see the many beautiful sights. Each accommodations also provides free toiletries in the private bathroom at Rocky Mountain Lodge & Cabins. Select houses provide an outdoor patio with a gazebo, barbecue facilities, and a fully equipped kitchen. Free parking is offered onsite. Hiking opportunities are close by Rocky Mountain Lodge. Manitou Springs is 5 miles away. Garden of the Gods is 20 minutes’ drive from Rocky Mountain Lodge & Cabins. 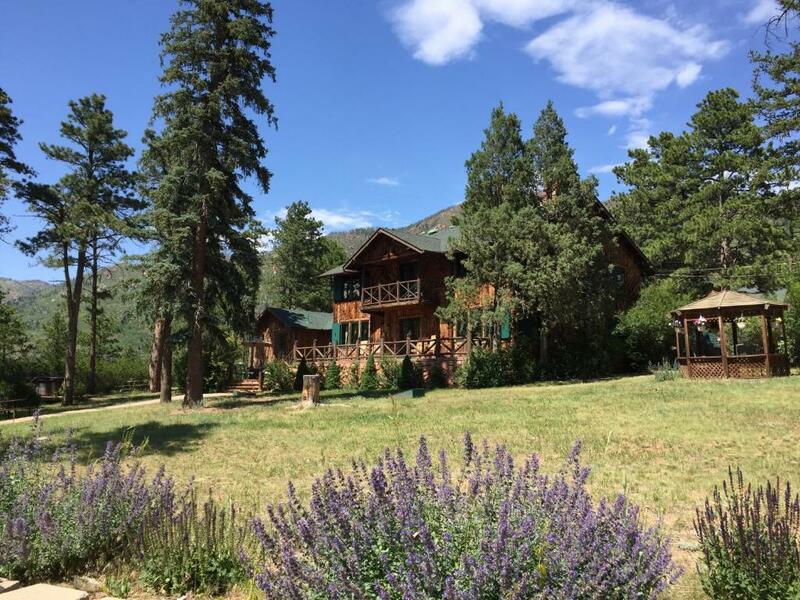 When would you like to stay at Rocky Mountain Lodge & Cabins? 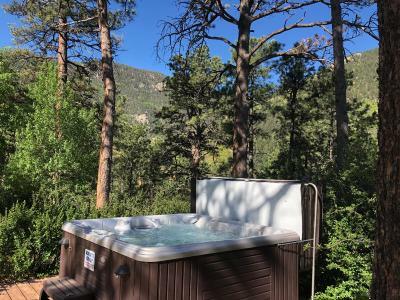 Featuring a private outdoor hot tub with mountain views, this cabin provides 2 bedrooms, a fireplace, cable TV/DVD player, free WiFi, a fully equipped kitchen, free toiletries and a spa bath in the jack-and-jill bathroom. Please note this room is also known as the "cabin". Offering free Wi-Fi, this cottage provides a mountain view, a fireplace, a fully equipped kitchen and free toiletries in the private bathroom. This mountain view suite has a sitting room with a cable TV/DVD player. A fireplace, dining area, small refrigerator, microwave, and coffeemaker are provided as well. 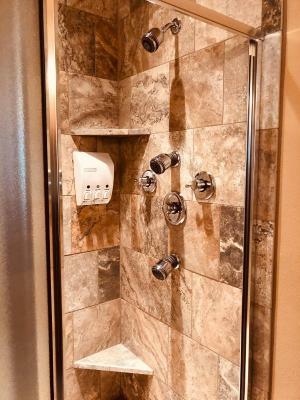 A shower and a jetted tub for two is included. An outdoor terrace and private outdoor hot tub are offered as well. House Rules Rocky Mountain Lodge & Cabins takes special requests – add in the next step! Rocky Mountain Lodge &amp; Cabins accepts these cards and reserves the right to temporarily hold an amount prior to arrival. Rocky Mountain Lodge & Cabins accepts these cards and reserves the right to temporarily hold an amount prior to arrival. Please inform Rocky Mountain Lodge & Cabins of your expected arrival time in advance. You can use the Special Requests box when booking, or contact the property directly using the contact details in your confirmation. To cold to go to hot tub outside so figured I would use the spa tub in bathroom. It was nice until you turn on the jets, here come chunks of black stuff...yuck! No A/C. Which is typical and didn’t bother me, especially because we were able to open the windows at night and let in the cool air, but it did bother my husband just a little. Room too small and configuration was poor.